Can you repair metal with a soldering station? The usefulness of your soldering iron is highly dependent on the job you want done and the type of metal you’re using. You can’t use just any metal with a soldering iron. The composition of different metals will affect how easily it can be soldered, and what kind of soldering iron you’ll need. Many first time users make the mistake of assuming that any soldering iron can fix any kind of metal. Anyone who’s tried and failed to solder hard metals with an everyday electrical soldering iron will know just how untrue this is. The solder won’t bond and you end up piling melted solder onto the metal you’re trying to bond. So, which metals are good for soldering? There are numerous factors that contribute to the solderability of a metal. Solders can be categorized as soft or hard, referring to whether the metals have high or low melting points. A metal with a low melting point is considered soft, and a metal with a high melting point is considered hard. Soldering irons use soft metals because they don’t produce enough heat to efficiently melt harder metals. Solders are usually made of more than one material depending on what kind of soldering you are doing. The most common solder used to be lead, which has a very low melting point. The upside of lead solders is that they are easy to melt and bond. The downside of lead (and any soft metal alloy) is that they aren’t as strong, so to get a stronger bond, solders often contain tin as well. Tin is strong, and while it has a slightly higher melting point, it produces stronger bonds. The combination of a soft metal alloy and tin varies solder to solder. For easier flow, a higher percentage of the alloy will be present. For stronger bonds, there is a higher percentage of tin. One issue with lead based solder is that it’s not ideal for soldering objects that will be worn (like jewelry) and handling lead has health risks. Nowadays, most lead solders are being phased out for health reasons, and replaced with other soft metal alloy based solders. Lead free solders are far more pervasive now, but generally they are equally effective. Another important component of solder is flux. 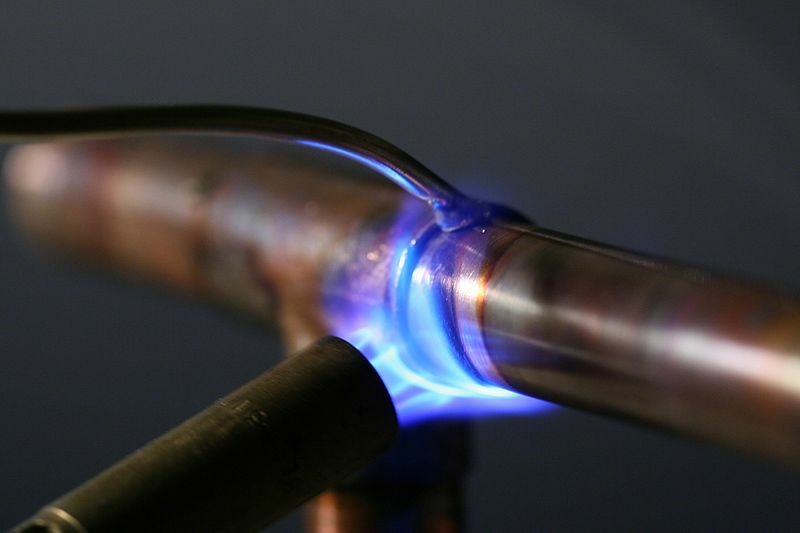 Flux acts as a catalyst allowing the heat from the soldering iron to melt the solder and make a chemical bond between the solder metal and the material you are soldering. Flux improves the flow and bond of the soldering, making certain metals easier to solder. Rosin flux and acid flux are the most common types. Acid flux is best for plumbing, but can corrode electronics. So electrical soldering typically uses rosin flux. Technically speaking, all metals can be soldered. But generally speaking, very hard metals simply will not bond. With their low melting points, copper, tin, zinc, brass, silver and bismuth are good and common soldering metals. Conversely, hard metals like iron, stainless steel, steel, and aluminum will not bond without highly specialized equipment. Soldering these metals requires specialized solders and fluxes, and the process can be much more hazardous and require experience. In most cases, these metals require torches that produce much higher and consistent heat to the metals in order to bond, and a basic soldering iron won’t work. In short, soldering irons work best with soft metals like zinc, silver, copper, and bismuth. Hard metals like steel, aluminum and iron require specialized equipment because they won’t bond if you attempt to solder them using a basic soldering iron.